The state-of-the-art Rotating Shadowband Spectroradiometer (RSS) combines a high-performance 1024-pixel CCD spectrograph with an external rotating shadowband similar to that used in our MFR instrument family. It automatically provides instantaneous direct, diffuse, and total irradiance measurements across the majority of the solar spectral range. System optics are thermally stabilized and environmentally sealed to provide excellent long term calibration stability. Instead of using a mechanically scanned diffraction grating, the RSS makes measurements simultaneously across all 1024 channels, and meets the Baseline Solar Radiation Network's requirements for atmospheric turbidity measurements. The shadowband enables the instrument to measure all three components of solar irradiance with one detector. The Model RSS-1024 covers the 360-1100nm visible/NIR range and the Model UVRSS-1024 covers the 292-370nm UV-B and UV-A range. Both systems feature web access to live or stored calibrated spectral irradiance and optical depth data, and use YESDAQ distributed database technology to support networks of remote systems around the globe. The Ultraviolet Multifilter Rotating Shadowband Radiometer (UVMFR) measures total, diffuse, and direct irradiance at seven narrowband wavelengths in the UV-B and UV-A regions. The shadowband enables the instrument to measure all three components of solar irradiance with one detector. The UVMFR-7 system includes the YESDAS-2 datalogger and data analysis software. The MFR-7, a shadowband instrument for the visible/NIR, is also available. 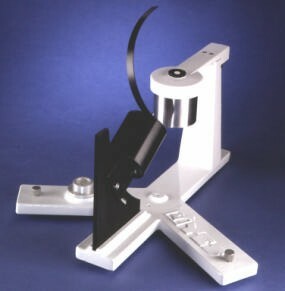 The SDR-1 Single Detector Rotating Shadowband Radiometer is identical to our standard Multifilter Rotating Shadowband Radiometer (MFR-7) except that it has a single cosine-corrected broadband silicon channel that provides fully automatic measurements of global, diffuse, and direct normal components of solar radiation. It is very similar to bolometric/thermopile type radiometers except the spectral response of silicon does not extend as far into the mid infrared. Historically, a total solar pyranometer has been integrated with a solar tracker-mounted normal incidence pyrheliometer and a third shaded pyranometer to make these measurements, as is done in the Baseline Solar Radiation Network. However, the SDR-1 offers a simpler and less expensive alternative than these separate instruments. Because it uses only one detector to make all three measurements, there is only one calibration necessary. In addition, because it uses only one mechanical axis of rotation it tends to stay in alignment with the sun much better than a two axis tracker, reducing labor required to operate the system. The UVB-1 and UVA-1 Pyranometers measure total irradiance from 280 to 320 nm and 320 to 400 nm, respectively. The instruments produce a high level 0-4 VDC output signal and are thermally stabilized for long term reference-grade measurements. The UVB-1 is field proven in networks throughout the world. Solar dose modeling software, UV-Calc, is included with the instrument. The UVPS power supply (shown) or the YESDAS-2 datalogger are available as accessories. The state-of-the-art TSP-700 Total Solar Pyranometer uses platinum resistance thermometers to make high accuracy broadband irradiance measurements and replace older thermopile measurement technology. The instrument offers an excellent cosine response and a high level output signal that is totally independent of ambient temperature changes. When properly characterized, the ventilated TSP-700 meets the requirements for a World Meteorological Organization high class pyranometer (formerly called a secondary standard). YES Models TSP-400 and TSP-100 offer lower cost alternatives for applications that do not require the precision of the TSP-700. The Model TIR-570 Total Infrared Radiometer represents the state-of-the-art for making precise field measurements of downwelling broadband atmospheric infrared irradiance. The TIR-570 uses a advanced chopped pyroelectric detector and precision interference filter integrated with a self-contained black body source to measure spectral irradiance from 4 to 30 µm. Global climate change researchers now have a tool for routine high accuracy atmospheric IR measurements.